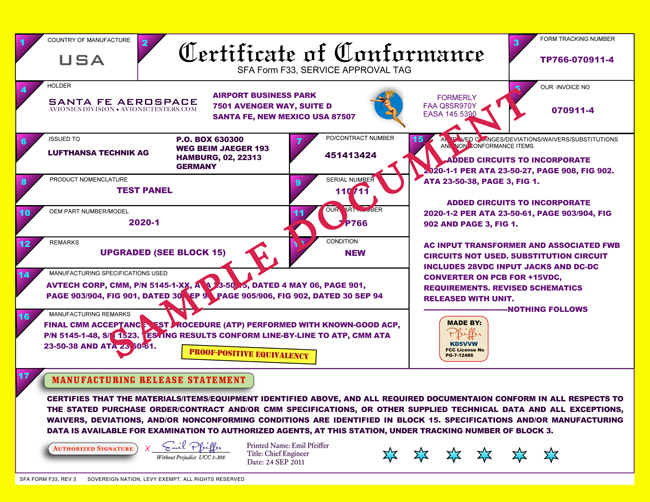 We can provide an optional “CERTIFICATE OF CONFORMANCE” for all of our custom made avionic bench test panels. This is a simple industry accepted solution in response to FAA/EASA/CAAC Inspector requirements to validate “equivalency” of your test panel purchases. The document details OEM specifications used (BLOCKS 12, BLOCK 14 and BLOCK 16) CMM standards used or other technical specifications, as used in the manufacture, of the referenced test equipment (BLOCK 8 and BLOCK 11). Further, the document also delineates all deviations, waivers, substitutions and non-conformance items of referenced specifications. ( BLOCK 15). Request at time of Order.